Survive the night terror hordes as an escaping robot in a retro sci-fi world. Use warp tubes, portals, conveyor belts, bombs and more to keep your circuits intact for another day. It took longer than intended to prepare, but now you can download the single-level demo of Agtnan: Monster Shutdown Sequence and play the DarkBlocks map. Give it a shot, and BE SURE TO WATCH THE TUTORIAL. Agtnan is a tricky beast, so don't let your haste be downfall. Hello everyone, and thank you for your interest in Agtnan: Monster Shutdown Sequence. We at AAGH Games are hard at work finishing up Agtnan for its projected summer release, but at the same time, we're also wrapping up the finishing touches on a demo for the game. Our goal is to have the one arena demo ready by the end of March, with eyes on the end of next week. 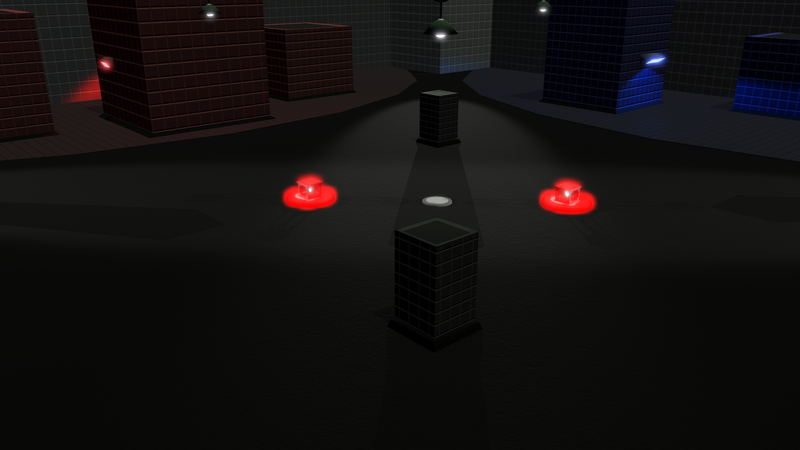 The demo will include one map, called Dark Blocks, featuring the normal game mode. Look for the demo to be ready before April 1st - no fooling! In Agtnan: Monster Shutdown Sequence, you are a robot, a robot on the run. You're released from your imprisonment to avoid or kill the night terrors sent your way for your captors' entertainment, just like the gladiators of old - if gladiators had CPUs and roller wheels. Survive, and you will be able to expand your abilities with Creds you've earned. If you fail, you'll be hammered back together for another go. It's a good thing your LED face comes equipped with a 'panicked' expression! SURVIVE - Survive various arenas, each featuring unique layouts, themes, hazards, and tricks. Rotating gears, moving platforms, and electric fences are just a few of the hazards you'll encounter. FIGHT BACK - You're not some powerless pawn - each map comes with bomb points where you can pick up explosives to take the fight to the night terrors. If you kill enough of them, maybe they'll retreat...? IMPROVE - Collecting Creds from night terrors and surviving will let you improve your circuitry, giving you new and improved abilities. Run faster and longer, take more damage, and even change how bombs work. Giant sticky bombs, anyone? STORY MODE - Who are you, really? Why are you here? Those are some of the questions we're going to answer with an upcoming story mode. You'll embark on a lengthy, action/puzzle adventure to find out who is behind all of this, and why. MORE ARENAS - Of course, we'll also be adding more new arenas to play in. Why? Because there are always new ways we can fry a robot's circuits. MULTIPLAYER - This is a long-term goal, set for some time after we add the story mode. Multiplayer arenas, where you can help or hinder your fellow robots' chances of survival.